Griffin McCray, a park ranger at Gettysburg, stays under the radar. He's been in law enforcement, but the death of a hostage eats him alive on the inside. Beautiful Finley Scott, an anthropologist, works on a dig in the area. The discovery of a body draws her into the investigation to identify the victim. 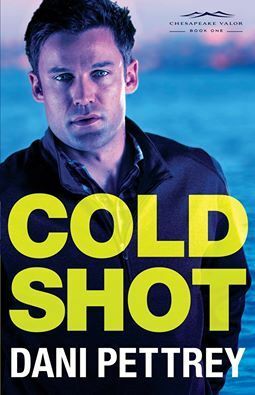 When she determines a sniper bullet caused the woman's death, the FBI is called in to take over the case. Griffin's friends, Declan Grey and Parker Mitchell, get involved in the effort to identify the woman and stop the sniper from striking again. He didn't bargain on falling in love or dealing with the hurts that made him withdraw from his passion for righting injustice. This is Book One of The Chesapeake Valor series by Dani Pettrey. I've read one other book by her, and she has a knack for ramping up the story tension. The characters are likable, and their faith shines through in a natural, unassuming way. She also did a wonderful job with her research. A plus - the author is donating some of the proceeds from this book to a human trafficking organization. I did wish for more information on Finley's background and family life. Perhaps the author will shed further light on that subject in future books. I marveled that everyone on the team were Christians, even people like Finley, a noted scientist. It required me to shrug off my doubts and flow with the story. All in all, it's an enjoyable story, and I'll be looking for the next book in the series. Four stars for this novel. Writers: How do you balance the plot and the characters? Do you give readers enough information on the characters to give them a sense of history? Please share. Readers: When something makes you pause and doubt the credibility of the story, are you able to put that aside and enjoy the story or is it a deal breaker? Why? like you, I stand on principle, too but have found if I open my mind to a new perspective, I can learn something whether I accept or reject the idea. Regarding your previous post, I too am questioning WHY I even write. I plod on ,but publication opportunities continue to shrink. I do enjoy giving talks on writing; maybe that's my new direction. Wishing you the best.